More than 20,000 runners crossed the finish line last year at the annual running of Walt Disney World s Disney Princess Half Marathon and Royal Family 5K in the late winter at the end of February, along an out-and-back route that starts and finishes in the parking lot of its Epcot Center, in the shadow of the resort s famed Spaceship Earth globe. The last few years have brought the addition of a new series of kids races as well as a one-mile fun run, and the half marathon takes runners through many of the tree-lined and sun-splashed resort s most scenic and famed attractions, including the Magic Kingdom and its Fantasyland, Tomorrowland and Adventureland the green fairways of the Walt Disney World Golf Complex and the World Showcase Lagoon just south of Epcot, which runners will follow the pathways around in their final stretch to the race finish. The course for the half marathon takes runners over paved surfaces throughout the resort, mostly on the roadways and paths that run through and between the exhibit areas along the race route. Runners can expect mostly flat surfaces for the first mile and the last couple of miles, with a few very gentle hills sprinkled in here and there. Once runners make it back onto World Drive, they’ll head south again toward Epcot for the race finish. 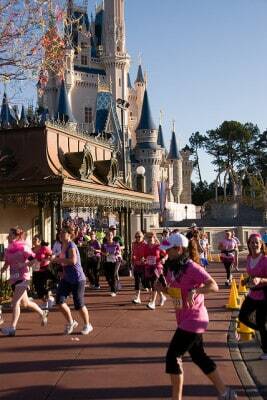 In keeping with the event s princess theme, the race is devoted to helping women of all ages achieve better fitness and awareness about their health, as all but just over 2,000 of the more than 20,000 half marathon finishers in 2016 were women. Located in central Florida, just a few miles northeast of the Walt Disney World resort and roughly 18 miles southeast of Orlando, Lake Buena Vista typically sees February temperatures that average between 73°F and 49°F, while precipitation totals average just over 2.7 inches for the month. On the day of the race (Feb. 26), the average high is 74°F and the average low is 50°F.